Tejashwi Yadav, who turned 28 yesterday, had earlier served as the Deputy Chief Minister in the Grand Alliance government of RJD, JD(U) and Congress. PATNA: Rashtriya Janata Dal President Lalu Prasad today dropped a hint that his younger son Tejashwi Yadav could be the party’s face in the next assembly election in Bihar. 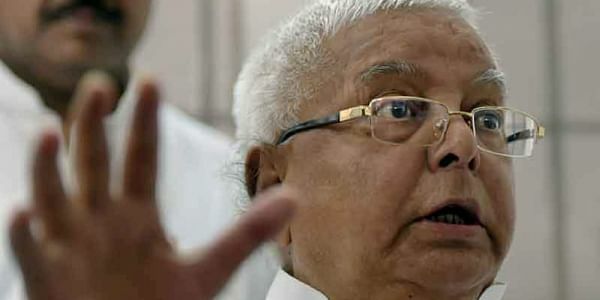 Asked for reaction on state RJD President Ramchandra Purve's comment that next government would be formed by the party under leadership of Tejaswi Yadav, Lalu Prasad praised leadership quality of his younger son. "He (Tejashwi) is way ahead of all of us in terms of leadership abliity and oratory. I am not saying this merely because he is my son," the RJD chief told reporters. Speaking after being elected the state president for the fourth consecutive terms recently, Purve had exulted, "we will form the next government in Bihar under the leadership of Tejashwi Yadav". Tejashwi Yadav, who turned 28 yesterday, had served as the Deputy Chief Minister in the Grand Alliance government of RJD, JD(U) and Congress. However, a note of dissent came from RJD national vice-president Raghuvansh Prasad Singh, who said the issue of a Chief Ministerial candidate was "premature" and that "good leadershipÂ” should be allowed to emerge by the time the state goes to polls. On Purve comment, Singh told a news channel "at party meetings, leaders tend to express their sentiments. Ramchandra Purve (state president) had done the same. In any case, no other claimant is going to come forward. Elections are quite far. We will take a decision at an appropriate time." "It is premature to think who will be the Chief Ministerial candidate when elections are far away. If Purve has said something, it is his personal opinion," the RJD National Vice President said. "Our endeavour should be to work for the people of Bihar. They are our 'malik' (master). It is the people who will put a stamp of approval on who should be the Chief Ministerial candidateÂ”, Singh said. Asked to comment on Singh's reaction, Lalu Prasad sought to clear the air saying "there is no mara mari (discord) within the party over the issue of Tejashwi". Meanwhile, the BJP reacted to Lalu's statement saying it was "an endorsement of dynasty rule which the people will not accept". "Lalu's statement is an open endorsement of dynasty rule in his party. While the stance of his party members remains to be seen, the prevailing public sentiment in the country is clearly against dynasty rule", the BJP's Bihar unit chief Nityanand Rai said.